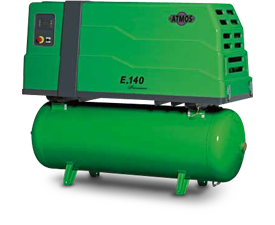 The compressors of the Albert range offer customers a compact solution regarding compressed air supply in power segment 5,5 - 20 kW. In the Premium range we offer 10 bar compressors (belt driven machines optionally also 8 and 13 bar) in comfortable and contemporarily designed fibre glass canopies. Albert Premium range brings to the customer much more – fully synthetic oil, the Airmaster S1 electronic control unit and a 5 year warranty for air end and electric motor. Contemporary technical elements are applied as standard - driven by industrial licence protected electric motor and air end direct coupling or drive via a flat multi - V belt. Albert compressors are remarkable for their high variability of every type, when it is possible to choose from the pressure variety with a wide scale of accessory equipment - several sizes of air receivers or models without a receiver on legs or with an integrated condensate dryer. Easy access to all components together with online support for aftersales services makes Albert compressors very easy to maintain. By using the components from renowned manufacturers (Danfoss frequency inverters, ingenious Airmaster S1 electronic control unit from CMC, controlled and uncontrolled suction valves from VMC, etc.) together with well proportioned coolers assures long reliability and durability of all Albert compressors. Our self developed, unique system of protection against compressor damage, i. e. ATMOS Care, is standard equipment in all our machines and is complemented with the ATMOSupervise self code generating system.